Stocks or Options for your portfolio? 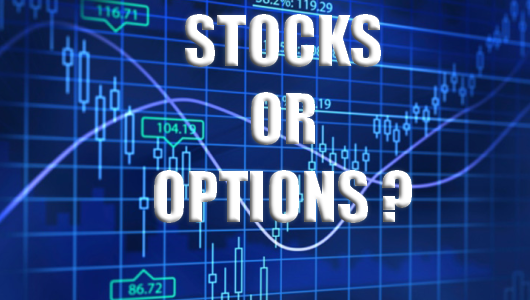 Should you invest in stocks or options? Options are a lot cheaper to buy than stocks, but there are some significant differences, advantages and disadvantages. It also requires a bit more knowledge than simply buying and holding a stock. If you're not interested in long term investing or dividends and you're not planning to hold on to a stock for very long then you may want to consider trading options. Let me explain. Many traders prefer to use options to reduce risk or, to do just the opposite, increase risk. Increased risk usually means increased rewards in trading land, why else would you take on more risk? The diversification in ones portfolio generally remains the same though: stocks and additionally some options or other leveraged products. Although it's not very common, it can also be the other way around: options can be the dominating trading vehicle in someones portfolio - like how it is in mine. Options yield by far a much higher return than stocks, but they trade differently. Option contracts are also a lot cheaper than stocks. Now, I can hear you think: 'an option contract is worthless unless you can exercise it', and that's true in a sense. The advantage of owning a stock is that you truly own a piece of that company. You are a true stock holder. With an option contract you only trade a little piece of risk, and you do not your own a share of a company. Another issue with options is that it has an expiration date, if you let your option contract expire worthless you lose your investment. However, the really big advantage of having a 'deep in the money' call option is that you are fully participating with the volatility of the underlying security, but since you've paid a smaller investment amount you risk a limited amount of your portfolio. You're not an owner of a company and you don't have voting rights or can cash in on dividends, but the difference in price is so humongous that we'll take that for granted. After all, the bottom line is to...well... increase the bottom line as much as possible - preferably in the shortest amount of time. I believe everyone would agree to that. This is of course a very simple example, but you can generally see how an option works. Of course we're not the only ones who figured out that options are a lot cheaper than buying and keeping stocks, that's why you would need to account for the interest rates when you trade options. But with the low rates of nowadays those costs are not that bad. Another advantage of having options in your portfolio with respect to stocks is that the risk is very easy to manage. In times of panic, exposure can simply be reduced by writing calls, or by setting up a whole different kind of option structure. When it comes to stocks it's often 'hold on tight, the ride may get a little bumpy', but with options you can take on a pro-active stance, that's why I personally favor options over stocks. And it looks to me it is also a lot more pleasant for someones portfolio and the piece of mind of the investor. Of course there are disadvantages as well, you have no rights to claim dividends - which is often a reason to invest for many long term investors. There are, however, little tricks you can do with options and dividends without owning the actual stock. 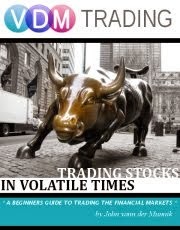 Aside from that you have volatility issues. Option contracts are very sensitive to volatility and that's certainly something that you'd have to keep in mind as a trader. Luckily with a little bit of knowledge (a basic option course for example) it's well manageable. Getting and keeping options requires a little bit more insight than simply buying a stock, but the profits are often a lot higher. Check out some of the results of some option portfolios. Trust me, the average stock trader will be jealous. 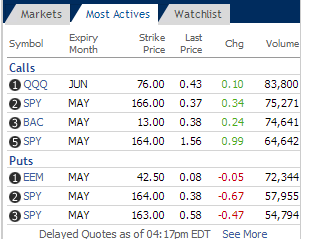 For the most active options I usually check out CBOE.com (Chicago Board of Options Exchange), but there are tons of other websites you can check out to find option quotes. Like CNBC, Yahoo, Google, or MSN Money, to name a few big ones. Look for the security you want and click on 'option chain' to find the most up to date prices, volume and expiration month. If there is no 'option chain' option that means that you can't trade options on that particular security. This is the case with penny stocks for example. Below is an example of CBOE's most actives as of this time of writing. CBOE's most actives. The QQQ, SPY and DIA (also known as the Diamond) are usually the most actives, they represent the NASDAQ, the S&P 500 and the Dow Jones ETFs.